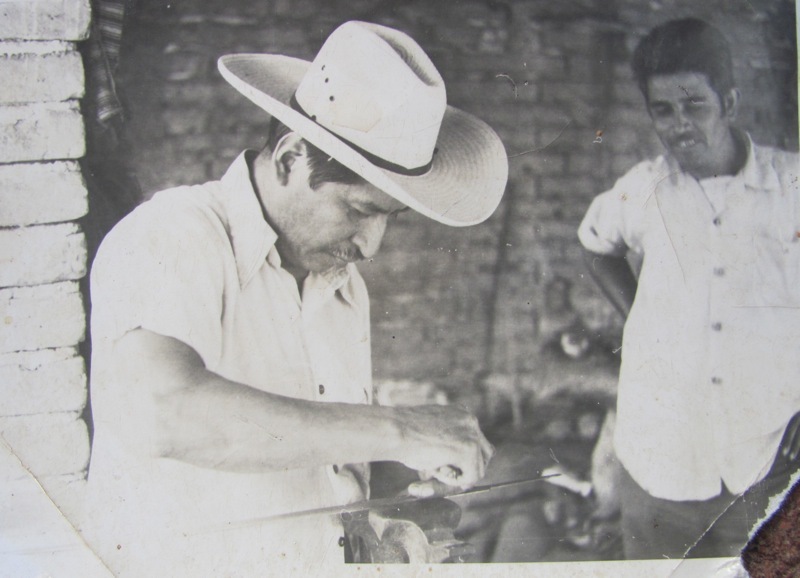 In 1980, my friend, the Mexican fiber artist Yosi Anaya, invited me to come visit her and to meet Don Primitivo Pablo Romano, a machete maker she knew who lived in the mountains of the state of Guerrero. Yosi described his work in great detail and explained how it was recognized as being culturally important by the Mexican government. I flew back to Mexico City with Yosi and stayed for a week with her and her mother. We traveled by overnight bus south to Guerrero and then a four-person single engine plane carried us up into the mountains……. There appeared to be nothing below, just dirt, trees and rocks. The pilot pulled what I thought was a logbook out from under his seat and opened it on the planes steering yoke. As I was sitting in the passenger seat up front, I looked over to see the log book was not a log book at all, but Jules Verne's Around the World in Eighty Days! The plane landed on a short grass landing strip that moments earlier had cattle grazing on it. We walked from there into the village of Cualac and started asking for Don Primitivo. _“Down the road and straight ahead.” Cualac was a very small village at that time. Electricity was not available through out the village, nor was municipal water or telephone. Don Primitivo answered our knock on his door and welcomed us warmly. We carried sleeping bags and had planned on camping out on his porch, but Don Primitivo insisted on putting up his guests properly. He took us to a stonewalled, thatched roof, dirt-floored restaurant/hotel in the center of the village. Inside there was a single picnic style table, un-husked corn heaped against the wall and chickens pecking at bugs. We were led to our room… a single small bed with a thatch mattress. There was a simple wooden table next to the bed with some candles, photographs and religious icons on it. I don’t remember what we ate, but that we ate well. Sleep was another matter. The bed was flea ridden and all night long, people came into the room, knelt down at the table by the bed, and prayed. Apparently, someone in the family had died recently (in this very bed!) and the bedside table was used as an altar. 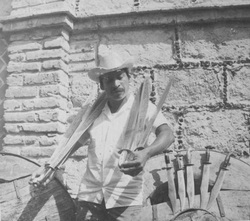 _Don Primitivo worked at his forge with his brother and young son. 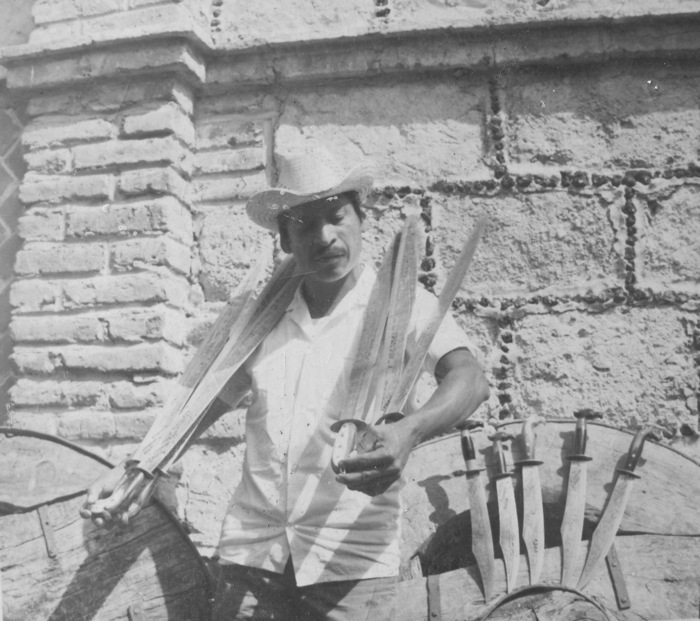 His brother acted as a striker, following Don Primitivo’s small hammer blows with a much larger sledge, while his son pumped the leather bellows of the charcoal fired adobe forge. He was using old leaf springs for the blades (a great blade steel, by the way) and cow horn for the handles. Like every other iron worker I have seen in Mexico, he was using something other than a traditional blacksmiths anvil. In this case what might have been a piece of railroad car axle. 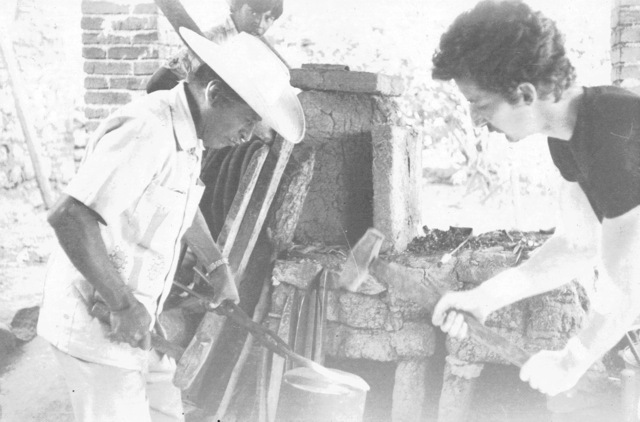 I wish that I had realized what I was actually seeing and participating in while working with Don Primitivo, as this was living history and would soon be gone. I look occasionally on Ebay for one of Don Primitivo's machetes, but none has turned up. He was still making real working tools and not the usual etched tourist pieces.